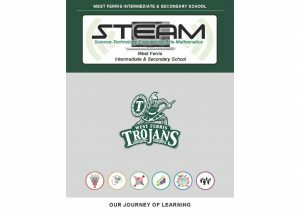 West Ferris Intermediate & Secondary School is thrilled to announce the retooling and redesign of their science and technology program, STEAM. STEAM is a cross-curricular and cross-panel program consisting of Science, Technology, Engineering, Arts, and Mathematics education with a focus on project-based learning using a variety of computer-based technologies. The program has taken on several different names since its inception as the ST-21 program in 1992. In 2005, ST-21 was transformed into the ST Wireless program with the inclusion of student laptops as the main learning tool. In 2009, further enhancements included the movement towards Apple MacBooks and iPods. STEAM students are co-learners with their peers and teachers using cutting-edge computer technologies. Learning in the STEAM environment will be transformative and will produce students who are critical thinkers, problem solvers, and leaders upon graduation. STEAM is an enriched academic program. Students wishing to apply to the STEAM program may begin the process by clicking on the button below. View our latest eBook Here! Parents and Students of the STEAM Program that are interested in Purchasing Apple Products to use in the STEAM program, please click on the image below to navigate to our Apple on Campus information page.